– for sci-fi action violence and some disturbing images. It’s sad to watch great artists fall. Let’s take a quick look at the rise and fall of one particular director. When The Sixth Sense wowed audiences in 1999, M. Night Shyamalan was being called the new Hitchcock. Unbreakable wasn’t quite the follow-up moviegoers expected, and its unexpected comic book themed premise shocked and polarized audiences. Signs renewed some viewers’ faith in 2002, but 2004’s The Village seemed to be the beginning of the end for the thriller director. By the time the sorely underrated Lady in the Water released in 2006, most audiences had written him off completely. It seemed to lead to his first R-rated venture with The Happening in 2008 which ended up backfiring tremendously. The absolute stinker The Last Airbender tanked in 2010, which brings us to the present with his first film in three years, After Earth. While the name “M. Night Shyamalan” had been a selling point for most everything after The Sixth Sense, you’d discover it nearly impossible to find his name attached to this one; it’s as if Sony knew it could be the kiss of death. Not surprisingly, After Earth didn’t get the warmest reception at the box office. 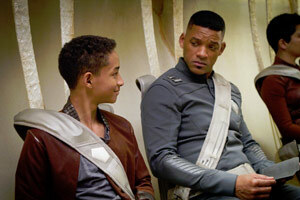 While it has the star power of Will Smith behind it, the film hardly makes the best use of it, as Smith clearly takes a back seat to give his son Jaden a chance to take lead. The end result is a film that has its heart and mind in the right place, but all the pieces don’t seem to fit well enough to make everything work together just right. And I have to admit I’m not entirely sure it’s all M. Night’s fault this time. After Earth takes place hundreds of years in the future, after humanity has vacated our home planet of Earth. Will Smith plays Cypher Raige, an all-star military man who has mastered the art of what they call “ghosting” — overcoming your fears to the point where a predator cannot find you. On his last mission before retiring (doesn’t that always seem to be the case? ), he decides to take his teenage son, Kitai, along for the mission. Kitai and his father are rather distant due to the amount of time he’s spent away from home, and the boy is in the middle of training hard to become a ranger, like his respected father. The routine mission experiences trouble when an asteroid field destroys their ship, stranding them on Earth. It soon becomes up to Kitai to travel across life-threatening terrain to retrieve a beacon that was shed from their crashed ship so they can be rescued. The film thematically is about a parent training up a child in the way that they should go but needing to accept the fact that eventually they need to let go to allow the child to bloom on their own. It’s also clear that, while the theme is occuring in the story, it’s also happening behind-the-scenes as Will steps back to allow Jaden to be the star. That’s an endearing concept but also a somewhat problematic what. Aside from the fact that you watch a Will Smith film for the purpose of seeing Will Smith perform in a movie, too much about After Earth rides on young Jaden Smith’s shoulders. Strong child actors are not easy to come by, but forcing them to be one when it’s not necessarily a natural talent doesn’t help anyone either. Jaden has worked best on screen when he’s had good direction, the right role, and the right costars, but one of his lowest points was the troubled remake of The Day The Earth Stood Still. M. Night Shyamalan is notorious for drawing wooden performances out of his actors to begin with, so when you toss an inexperienced actor into that situation, it’s not pretty. To his credit, Jaden fairs better more times than not–his a kid playing a kid, afterall–but since he’s the person we see on screen most, it does a disservice to the film. The most dodgy instance, however, is when, before the film’s final act, Kitai and Cypher get into an argument which causes Jaden to deliver a rather whiney performance on par with Hayden Christensen’s temper tantrum in Star Wars: Attack of the Clones. And the fact that the scene involves a far superior actor in Will Smith doesn’t help Jaden either. The content is M. Night Shyamalan movies has always been one thing above all else: violence. Possibly the most gruesome sequence finds Kitai coming upon a dismembered monkey arm (complete with bloody stump) before finding a whole pile of dismembered monkey parts from several different animals. Another scene shows Cypher trying to give himself a blood transfusion of sorts and we see a tube he just stuck in his thigh filling with blood while we see the wound and blood around it. Finally, another scene shows Kitai dreaming and imagining a girl talking to him. She tries to get him to wake up and when he doesn’t, her face suddenlt turns bloody and cut up on one side. It’s like M. Night took a cue from his Sixth Sense days too much (and sadly, I saw the idea of using the gross face to shock Kitai and the viewer coming!). Language is contained to only 1 “d*mn” and there is no sensuality or sexual content. 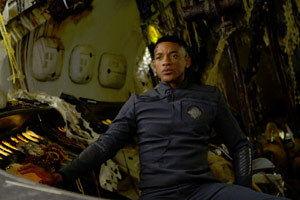 For the most part, After Earth is a step in the right direction for M. Night Shyamalan. It’s by no means his best work or even close to it, but given how poor his recent projects have been, this is still a step up. Diehard fans of Will Smith might feel shortchanged by his lack of screentime (mostly because he literally hangs back to let Jaden take the sole spotlight for most of the movie), but his presence still adds to what otherwise would be a completely lost effort. 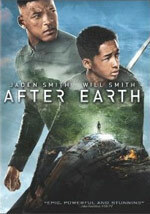 After Earth is available on a Blu-Ray/DVD combo pack or on DVD separately, both with Ultraviolet digital copies as well. We were sent the DVD to review and, being as conditioned to watching Blu-Ray as I am, I’d recommend skipping the DVD and picking up the Blu-Ray if you have HD capabilities. Apparently, Sony makes some pretty poor quality DVDs as some scenes had visible pixelated halos around characters’ faces. I’ve seen high quality, standard definition DVDs before. Sadly, Sony doesn’t make them. With Blu-Ray being their own creation, it’s not surprising that they’d want to dissuade viewers from continuing to buy DVDs. Most stream qualities these days are clearer than this DVD appeared to be. A Father’s Legacy (8:53) – This is really the only behind-the-scenes featurette on the DVD. There’s a slew of on-set footage of Will and Jaden working together and goofing off. Here, Will and M. Night talk about the theme of parents letting their kids go to experience what they taught them on their own. There’s some great B-roll footage of the scene where Cypher and Kitai argue, and although it happens over communication and not in person in the movie, Will is seen right off camera reading his lines for Jaden to act off of. It’s also clear that Will used this production to mentor his son as an actor. 1000 Years in 300 seconds (5:27) – This is a montage set to music from the film of behind-the-scenes footage (with no dialog). The Nature of the Future (5:24) – This is another montage set to music of nature footage. Xprize After Earth Challenge (3:36) – Sony hosted a contest for fans to come up with a “plan” to save Earth. The video shows the winner’s Lego model and then lists the names of the runner-ups. Alcohol/Drugs: Cypher injects himself with painkillers after being injured and he starts to get drowsy. Blood/Gore: We briefly see a dead body with blood on their hand; Cypher slashes the neck of a monster with a blade and we see some bloody bits fly through the air; Cypher has some blood on his head; Kitai moves Cypher’s legs and finds blood on his hands; We see a dead body hanging outside the ship with blood on them and on the area underneath them; We see an x-ray with a broken bone; Kitai finds a leech on the back of his hand with a bloody scab around the wound. His face starts to swell up until he can inject himself with the antidote; A scene opens with Cypher grunting and holding a bloody scalpel in his blood-covered hand. We then see a tube filling with blood that’s sticking out of the side of his leg with lots of blood around it on his leg; Kitai finds a bloody, dismembered monkey arm. We see the bone sticking out of the one end and it’s rather gory. He then moves away from it and sees a large pile of pieces of other monkeys with lots of blood; Kitai sees a tree in the distance with two guys impaled through the chest on its branches; We briefly see Kitai’s sister’s face suddenly turn bloody and scarred on one side while he’s dreaming about her; We see a slightly bloody cut on Kitai’s leg as a beast scrapes it with its claw; We see blood under Kitai’s hand while he’s laying on the ground; Kitai slashes off a monster’s leg and we see a little bit of bits fly from that. Violence: We see a man get sucked through the inside of a ship very suddenly; We see archive footage of people running during a battle of some kind; We see people running and being shot down or attacked by an alien beast; Cypher slashes the neck of a monster with a blade and we see some bloody bits fly through the air; We see a man with a scar on his forehead and missing a leg; An explosion rains debris on a ship; We see some people get sucked out of a ship that’s breaking apart; We see a quick flashback of an alien beast attacking a home; Kitai throws rocks at monkeys and they chase him; Kitai finds a leech on the back of his hand and he pulls it off and struggles to inject himself with an antidote before passing out. He sticks himself with one needle into the heart and then has to fall over onto the other syringe to inject the second one; Cypher cuts his leg (not seen) and then we see a tube filling with blood sticking out of it (which is shown); Kitai comes upon a pile of dismembered monkey parts; We see an extended flashback of an alien beast throwing a person against the wall and then stabbing them through the chest with a sharp claw; Kitai leaps off a cliff and a large bird attacks him in mid-air; A lion attacks a baby bird and threatens Kitai. Another lion attacks but the mother bird grabs it and drops it to the ground. The other lion= lunges at Kitai who knocks it through the bottom of the nest. We then see a bunch of dead baby birds. We soon see the mother bird on the ground nudging another dead baby bird; Kitai sees a tree in the distance with two guys impaled on its branches; Kitai dreams his sister is there telling him to wake up. When he insists on staying asleep, her face gets grotesque and bloody and it startles him awake; An alien attacks and chases Kitai. At one point it scrapes his leg as he tries to get away. The beast soon catches up with him and knocks him around till he’s lying on the ground stunned a bit; We see the flashback again of an alien attacking and throwing someone; Kitai slashes the leg off of an alien beast with a blade and then separates the blade and drives it into the creatures back a couple of times until it’s dead.